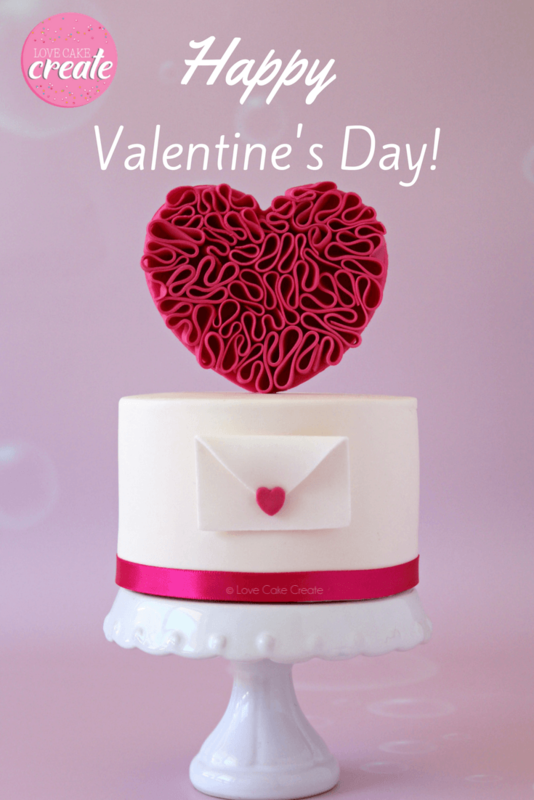 Valentine’s Day ruffle heart cake tutorial – Create a sweet and romantic cake design with an easy heart cake topper and miniature fondant envelope. 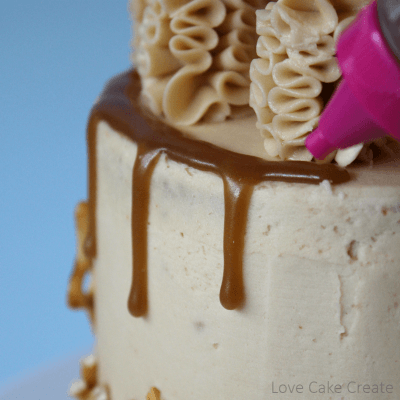 This mini cake is surprisingly easy and perfect for a Valentine’s Day surprise. 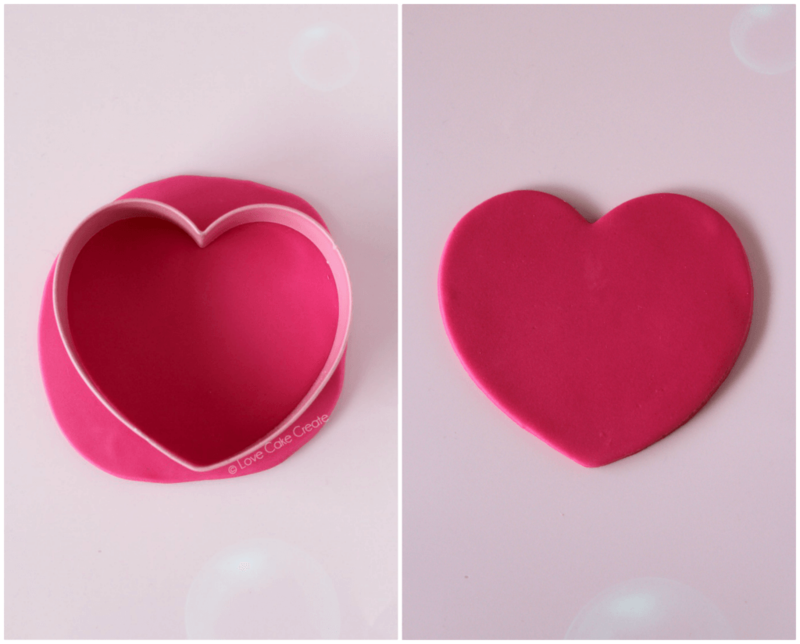 The modern heart topper is a great addition to your Valentine’s Day cake and also makes a sweet statement on an anniversary cake, bridal shower cake or wedding cake. 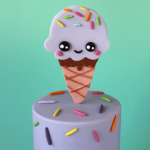 So many different options with this style of cake topper! 1 x 3″ round x 3″ high cake covered in pale pink fondant (I used Americolor Soft Pink). 1. Take a small ball of pink fondant and press it into the tylose/cmc powder. Mix in the powder that sticks to the fondant. Repeat that once more. This will ensure the heart silhouette dries quickly and firmly. 2. 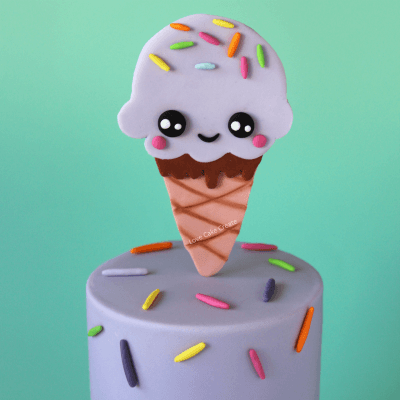 Roll out that ball of fondant to approx. 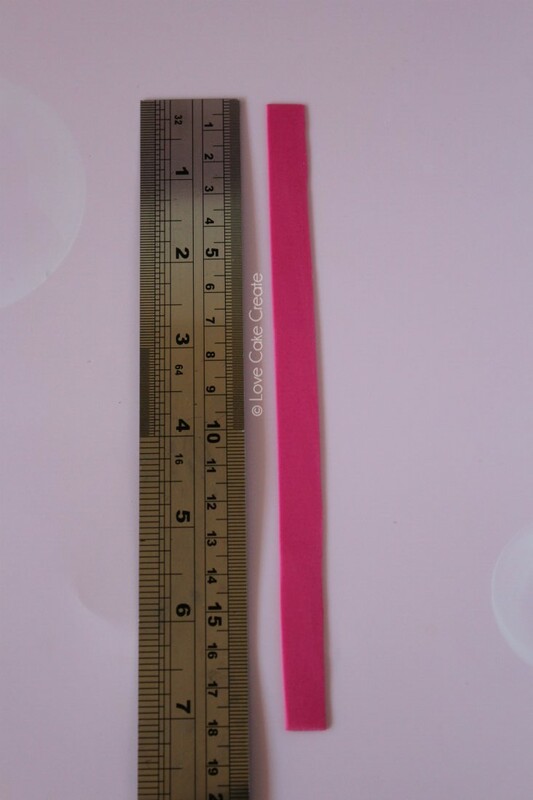 5mm thickness (it needs to be slightly thicker than the toothpick/cocktail stick so the stick isn’t visible when inserted into the heart). Take your heart cutter and press down to create a heart shape. Use your finger to gently smooth over the edges to remove any rough, frayed bits. 3. Take the toothpick/cocktail stick and brush a little sugar glue at one end. Gently insert that end into the bottom of the heart. 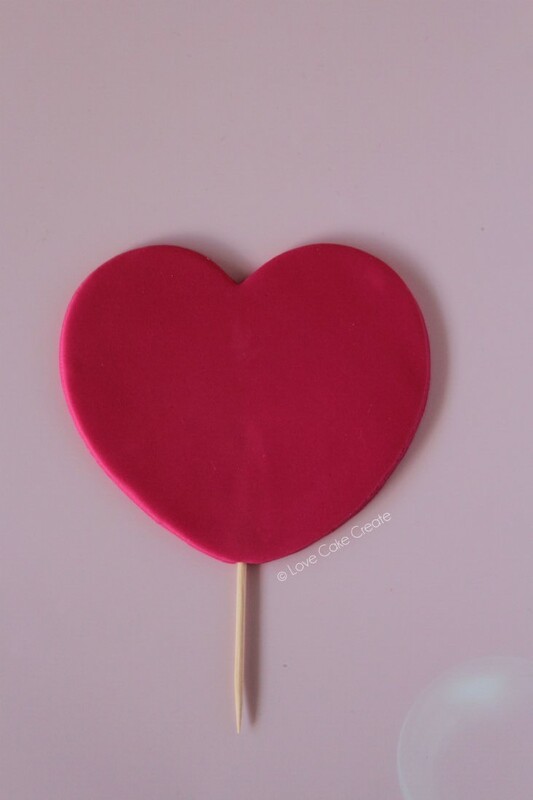 If you place a finger and thumb on either side of the heart as you’re inserting the toothpick/cocktail stick, you can feel whether it’s being inserted straight and not breaking through the fondant. The aim is not see the toothpick/cocktail stick on either side of the heart. Insert the cocktail stick approx. half way up the heart. 4. Once the stick is inserted, lay the heart flat and use your finger to gently rub over the front of the heart to smooth out any bumps. Allow it to dry for a few hours. 5.Once the heart has firmed up, you can start the ruffle design. Add some tylose/cmc powder to the pink fondant and mix it in well. Roll a long thin sausage and use your rolling pin to roll it out nice and thin. You want these ruffles rolled thin because if they’re too thick, the topper will be clunky and bulky. Use the exacto knife and ruler to cut out the long strip – mine was approx. 18cm long x 1cm wide. 6. Brush a light layer of sugar glue/water over the front of the heart. Take the long strip and start to arrange it on the heart as shown below. The aim here is to have the strip in a wavy pattern and not in straight lines. I found adding a dab of sugar glue/water in-between some of the ruffles helped keep them in place and held them together. Apply gentle pressure to the top of the strip to ensure it’s stuck properly to the heart. Once that first strip is attached, repeat the process with additional strips until the entire front of the heart is filled with ruffles. Pop it aside to dry completely. 7. Take a small amount of white fondant and add a little tylose; mix it in well. Roll the fondant quite thin. Use the ruler and exacto knife to cut out a shape like a house (ie a rectangle on the bottom and triangle on the top). Mine is approx. 5cm along the bottom of the rectangle x 3cm up the side. Add the little triangle on top. 8. 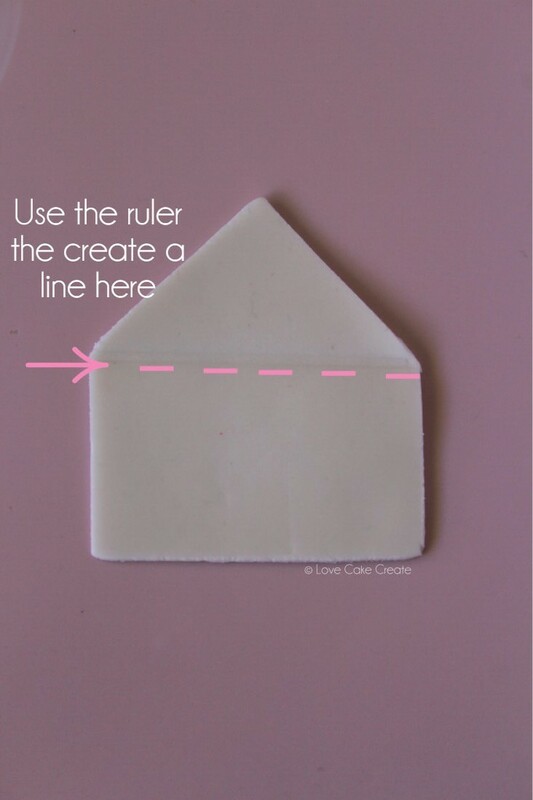 Use the edge of the ruler to gently press down on the fondant in-between the rectangle and triangle. We don’t want to cut through it, just apply enough pressure to make the impression of a straight line. This will make folding over that top flap easier and neater. 9. Brush a little sugar glue/water at the very top tip of the triangle. 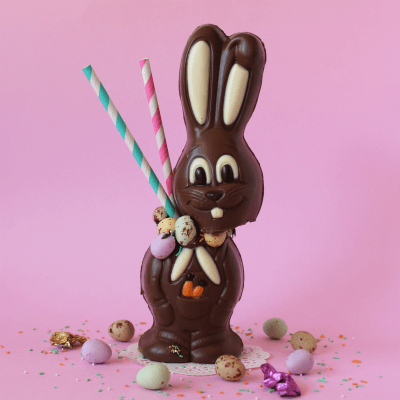 Fold it down, gently pressing where the sugar glue is so it adheres to the envelope. The aim here is to have the sides of the flap open, so if yours are not staying up, pop a little paper towel/kitchen roll underneath to prop it up. 10. Take a tiny amount of pink fondant and roll it out thinly. Use the small heart plunger/cutter to cut out a heart. If the edges are a little frayed, use your finger to smooth it over. 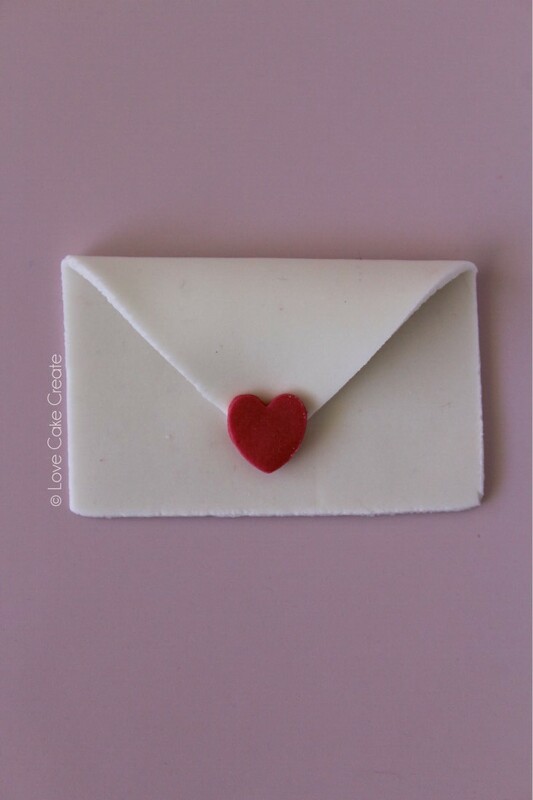 Apply a tiny amount of sugar glue/water to the back of the heart and attach it to the envelope as shown. Pop it aside to dry completely. 10. 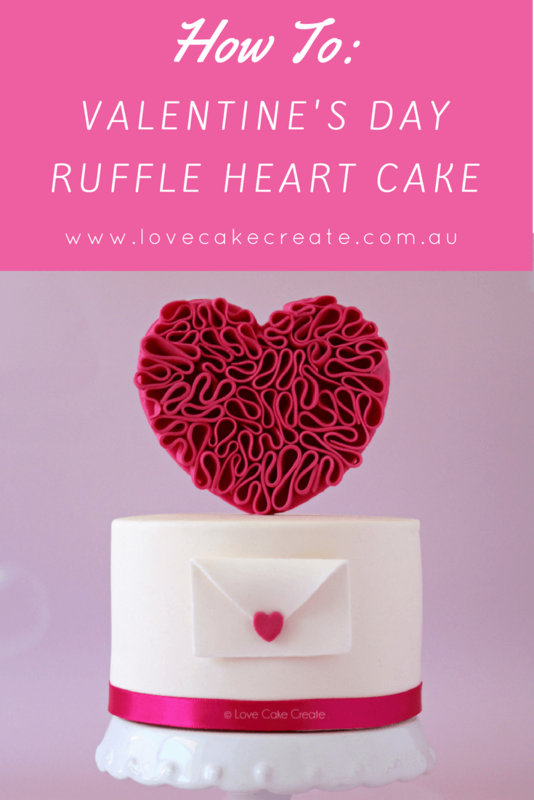 Once the ruffle heart topper has completely dried, it can be inserted into the top of the cake. 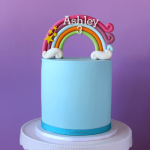 You can add a little sugar glue/water at the very bottom of the heart where it meets the cake and this will prevent the topper from moving around. 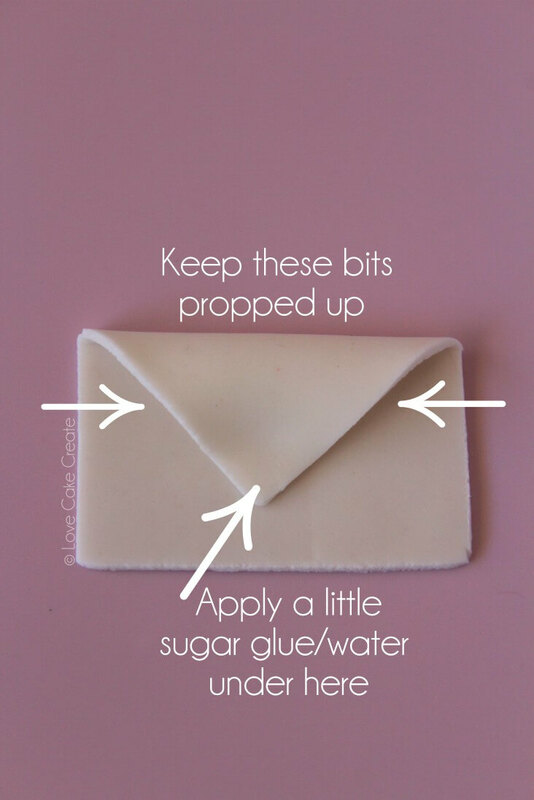 To attach the envelope, apply a small amount of sugar glue/water to the back (in the centre) and hold it in place for a minute or so until it’s secure. 11. Lastly, add some pretty pink ribbon around the bottom of the cake. 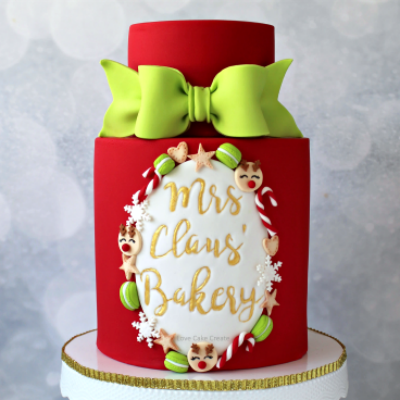 Now you can stand back and swoon over your gorgeous cake! 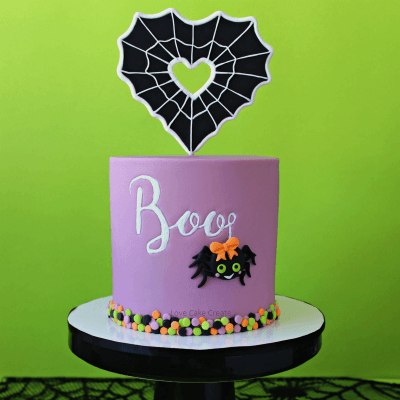 For such a simple topper, it really adds impact and makes a sweet, modern statement. 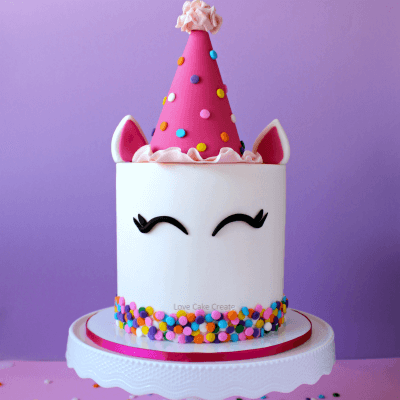 If you’re new to cake decorating, check out my 10 Tips and Tricks for Cake Decorators post – you’ll find everything from how to watermark your cake pictures to using backdrops and joining Facebook groups for cake decorators. I hope you enjoyed this Valentine’s Day ruffle heart cake tutorial! I’d love to hear your feedback in the comments below – have you ever made a cake topper like this before? If you liked this tutorial, don’t forget to PIN it!